WHAT: A "blind" (though not blindfolded) cupcake tasting including three batches of cupcakes: homemade "regular" cupcakes, vegan cupcakes and from-a-mix cupcakes (below, from left to right in order of description). To try to keep things fair, we made each batch the same flavor combination: vanilla cake with chocolate frosting. Cakespy Note: There were some inherent variations between the cakes, but we tried to keep them as similar as possible. The homemade dairy cupcake recipe came from Cupcakes! 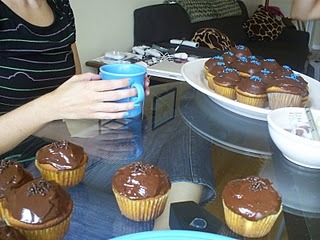 by Elinor Klivans; the vegan cupcakes recipe came from Vegan Cupcakes Take Over the World! by Isa Chandra Moskowitz, Terry Hope Romero, and Sara Quin; the Mix was courtesy of Betty Crocker. 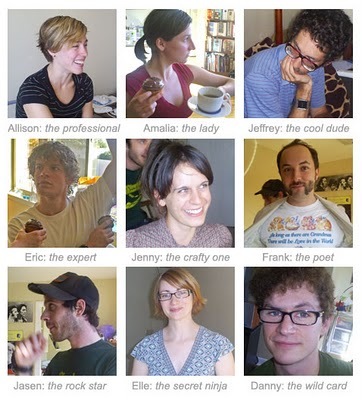 HOW: Each participant was given three cake samples labeled A (homemade "regular"), B (vegan) and C (from-a-mix), as well as a scorecard. Upon tasting each sample, filled in their cards with guesses on which cake was which, and voted on which one they liked best. WHY: To see if people could tell the difference between the three batches; also, to see which ones tasted best. RESULTS: Well, nobody had any trouble picking out the vegan cakes from the others; of course, their frosting texture was noticeably different and the cake much more dense. Nonetheless, we didn't see anyone who left the vegan portion uneaten, which in itself is very telling! 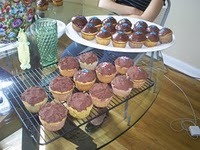 A few people did mix up the homemade and mix-made cupcakes though. But most importantly, which one tasted best? The tally came in as follows: Homemade "regular" cupcakes came in first with 4 votes; Mix cupcakes and vegan cupcakes tied for second place with three votes each. CONCLUSION: When it comes down to it, cake is an innately good thing, fulfilling both mentally and physically. Our testers' comments reflected this very much; while the denser cake was "spongy and satisfying" to one tester, the mix cupcakes brought on memories of "childhood sugar highs", and yet another noted that the dairy homemade cupcakes reminded him of those his mother used to make. Cake is about comfort, and no matter what the label, if it's made with love and enjoyed in good company, it's bound to be a rewarding experience. Awww.